Masaaki Tanabe discusses his documentary, "An Unrecognized Loss: Message from Hiroshima" to a panel of animation students Saturday, May 1. Courtesy of Mark Farquhar. The day the bomb dropped, an entire culture disappeared. Before, the town was bustling with life. Festivals were held in the streets. In the summers, cicadas buzzed in the trees, birds chirped and children played in the river. Documentary film director and Hiroshima survivor, Masaaki Tanabe, presented his 33 minute film, “An Unrecognized Loss: Message from Hiroshima,” in Noski Auditorium Saturday, May 1 to a handful of CSUN animation students who helped recreate his childhood home through computer graphics. The film, which was presented at the United Nations Nuclear Non-Proliferation Treaty Conference on Monday, incorporates hand sketches, computer animations and candid interviews of survivors — many of whom are speaking out for the first time. This film was the last of a five- part series Tanabe produced in an attempt to recreate Hiroshima prior to the atomic bomb. He hopes to present his film to President Obama. Animation professor Mark Farquhar and his wife, Yuriko Senoo were invited to help recreate some of the landmark buildings in the documentary. Senoo had reached out to Tanabe through a mutual friend. Farquhar and Senoo have been working on the film since September 2009. “He approached us to help him rebuild some of the parts in the film, like Cafe Brazil, the movie theater and Nakajima Street, and we put together a group of students who would be interested in working,” Senoo said. The film unfolds, detailing life as it once was in the energetic city of Hiroshima. Tanabe’s house was located less than 200 feet away from ground zero. He was seven years old when the nuclear bomb destroyed the town. He was evacuated just days before the bomb dropped, to his grandmother’s house 37 miles away. Tanabe said no one was prepared for the nuclear bomb, or had any idea what it actually was. Tanabe’s father was in the military, and he said that days leading up to the bomb, his father’s demeanor started to change. “(I) noticed that my father’s expression was becoming darker and darker … so (I) had less and less conversation with him,” he said. His father sensed that something big was going to happen, and sent the family away. However, his mother and infant brother, went back to Hiroshima to take of his father, two days before the bomb dropped. It was 8:15a.m., Tanabe said, describing the day the bomb dropped. He was at his grandmother’s house playing hide and seek with a friend. “I happened to be facing the direction of Hiroshima city and I saw a flash of light and (heard) a big boom, and I thought something happened,” he said. The film showed drawings of people on fire, dousing themselves in the river. Many drawings showed people with charred skin. “Two days after the bombing, I went to the city to look for my family…and what I saw or touched or smelled… it was like hell,” Tanabe said. “There was nothing” said Tanabe of his childhood home, “there was nothing,” he repeated softly. Tanabe’s mother and brother died in the blast. His father survived, but suffered major burns. He died the day Japan surrendered, Tanabe said. Senoo said that Tanabe has not talked about Hiroshima for 60 years. At 73, he has finally come forth in an effort to preserve the stories of the survivors. However, recreating Hiroshima has been a painstaking process, Tanabe said. He had to rely on the memories of the survivors to restore the town is it once was. Using photos he could gather from research and other survivors, Hiroshima slowly came to life. “There was lot of labor involved, a lot of back and forth… it’s the people who walked those buildings that would remember,” he said. Tanabe said the photos of his house is now stored in the National Archives and Records Administration, (NARA) in Maryland. He said that a week prior to the bombing, American planes circled the area taking aerial photos of the bombsite. “Planes flew by high in the air, taking photos luxuriously because people didn’t own any weapons — they didn’t fight back. Even if they did have weapons, they wouldn’t reach that high up,” he said. Tanabe said that he has been to the NARA five times to do research, and was able to gather 500 photos that were used to digitally restore Hiroshima. “That photo was very important to replicate the town,” he said. Since then, Hiroshima has been rebuilt by outsiders, unfamiliar with the town. 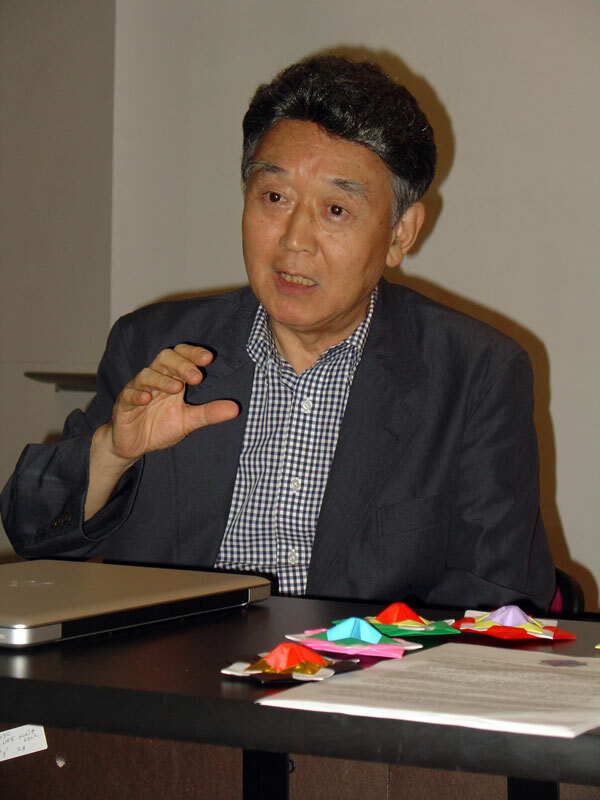 “All Hiroshima people were gone, and outside people came in and planned the new city. The traditional city is gone … the old festivals and cultures are gone, it’s all outside culture,” he said. Tanabe said he did not create the film for political reasons, rather, it is a message of peace to future generations. His hope is to prevent another nuclear bomb from ever dropping. “(Hiroshima) will never come back, that’s what’s devastating about the bomb, it has destroyed history.